Introduction: Many anglers yearn for a line that is as easy to cast as standard mono, but are as invisible as pure fluorocarbon. P-Line develops their new Floroclear copolymer line to be a single line that exhibits the most desirable attributes from both copolymer and fluorocarbon. Impressions: Many Fluorocarbon lines I have tested thus far have been excellent in terms of invisibility under water, but all have been a bit too stiff for my tastes. This is especially the case when it comes to lines between 2-6lbs. With light lines such as this you are most likely tossing the lightest of lures, and any added stiffness in the line not only reduces your casting distance and accuracy, but increases the chances of those nasty line twists. The premise behind P-Line Floroclear's construction was to create a copolymer core and a fluorocarbon coating to reduce visibility. In this way the P-Line engineers hoped to create an extremely manageable and effective line. The foundation of this line utilizes the very same copolymers used in other P-Line Products, but is enhanced to have even less memory. 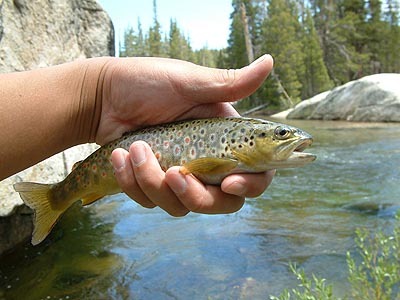 Real World Test: What better way to test the cast and presentation capabilities of this copolymer line then on the shy backcountry trout in the Yosemite High Country. 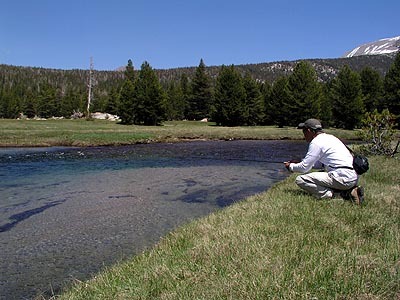 With the recent snow melt the rivers in upper Yosemite are ultra clear, and hold many medium sized trout that survived the harsh winter. 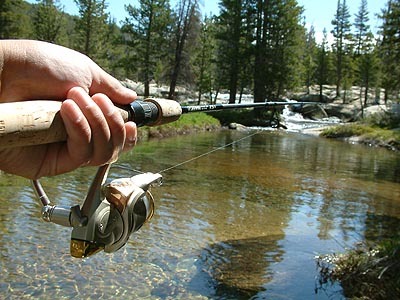 Knot Strength: One of the main advantages of a copolymer line over pure fluorocarbon is the increased knot strength, and abrasion resistance. Pure fluorocarbon lines can often break down quickly and become brittle. We tied a variety of lures on the Floroclear including Blue Fox Vibrax, Kastmasters, and my favorite...Panther Martin spinners. The waters we tested the Floroclear in were ice cold, as the streams were basically direct runoffs from the melting snow in the nearby Sierras. In these frigid conditions the trout were exceptionally active and fought violently once hooked up. Not once during our test did a fish successfully break the line at the knot. Casting: Casting ultralight lines can be frustrating for many anglers because of loop issues. Coupled with a small enough reel the P-Line Floroclear casts like a dream. While still slightly stiffer then some mono lines, P-Line Floroclear is probably the most manageable hybrid line I have ever fished with. With a .18mm diameter this line is considered very thin for a 4lb line, and you can fit plenty of it on even the most ultralight spinning outfits. The Fluorocarbon coating serves a dual purpose, not only does it promote invisibility but it also prevents water absorption into the line's core, giving the line greater casting distance and manageability. I was able to present even the smallest lures with no difficulty. When fishing in ultra clear water positioning is vital, as a single miscast can spook fish and eliminate any chance of a take. Visibility: Here is where Floroclear really shines. With the ability to cast like a mono line anglers now retain the advantage of a fluorocarbon coating. With a refractive index very close to that of water the Floroclear appears virtually invisible underwater...and when I say invisible I mean it! 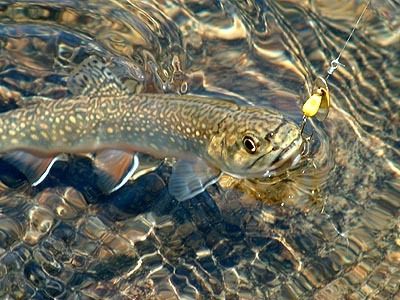 Your lures look as if they are swimming freely in the water below. I caught over 30 fish on this last trip, a much larger number then times I have come to the same location using pure 4lb mono. 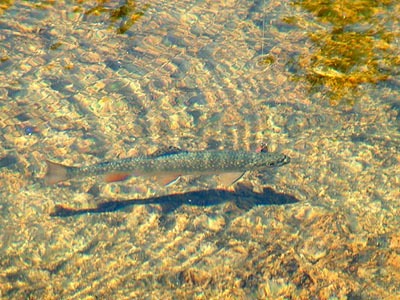 Lure presentation is crucial to these shy wild trout, and this invisible line definitely helps present lures with more realism. Durability: We fished with the 4lb P-Line Floroclear during the entire field test. While 2lb lines will help you cast farther with lighter lures you definitely will find yourself losing more lures, and potentially losing large fish if you try and muscle them. With 4lb line you have a little more backbone when turning these energetic fish, and still can relish the fight. P-Line has always been known for high durability, and are often the #1 choice for Fly Fisherman when it comes to choosing strong tippet. In P-Line tradition Floroclear is extremely durable for such a thin line. When in the backcountry your lures are often inches from the bottom and your line is in constant contact with rough abrasive surfaces. At the end of the 3 day trip the entire line remained in excellent condition, and ready to tackle our next destination. Conclusion: Floroclear is the newest addition to P-Line's family of premium lines. The combination of a copolymer core and a flurocarbon outer layer allows anglers to benefit from the best of both worlds. In our backcountry test this hybrid line exhibited very low visibility, excellent knot strength, and accurate castability. While the ultra light lines are excellent for spinning gear, the heavier Floroclear lines are also suitable for extremely delicate baitcasting presentations as well. If your looking for a line that can offer you that extra edge you don' have to look any farther the P-Line's effective new hybrid.... Floroclear.